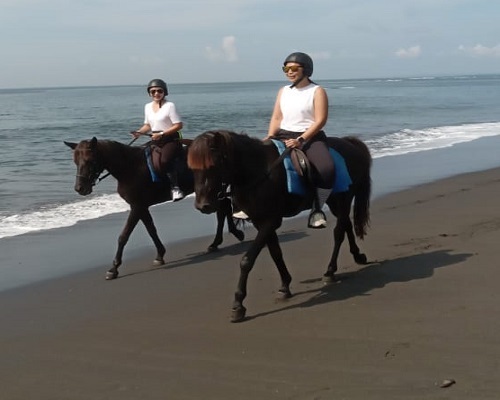 Bali Horse Riding packages we offer in this combination tour Bali Horse Riding and Jatiluwih Tour packages is to enjoy riding a horse in beautiful beach with amazing view and professional horse riding guide during the adventure. It provides the exciting horse riding adventures by the best selection of tame and healthy horses to explore the beautiful beach with sea breeze blowing and covers the coastal area. The stables are set in the coastal side with tropical plantation surround it . Your horse riding trail will passed the local village and through the beautiful beach. Bali Coffee Plantation is a place you can see various of plantation such as coffe arabica, coffe robusta, pineapple, balinesse snake fruit, and etc. expereince to see how to make Balinesse coffe, try the best of balinesse coffe or ginger tea with green view river valley. They sell variety of theirs original Balinese coffee products, herb oil and etc and see the civet cat the most expensive coffee maker, wellknown as Luwak , its produce "Coffee Luwak" and the process of the bean passing through the digestive tract of the civet chemically alters the proteins in the Luwak coffee bean to yield more complex and smooth flavors, not found in conventional coffees. Jatiluwih is a name of country side located in the plateau area with the mountain as a backdrop. It owns very beautiful panorama of rice terrace unfolding from the foot of mountain to the sea, the cool atmospheres surround the area of Jatiluwih with the good water irrigation. 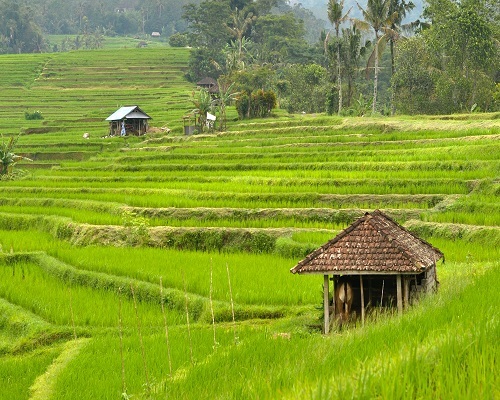 Jatiluwih rice cultivation has an area of approximately 636 ha. And this Jatiluwih rice field located at an altitude of 700 meters above sea level. This area is a suitable place to visit for the one who missed the Mountain fresh air and the natural panorama as a place to soothe the mind, because of the beautiful place that is still natural with fresh air. Ulun Danu Beratan Temple is a temple dedicated to the goddess of the lake is Ida Batari Dewi Ulun Danu on the edge of a huge crater. Lies by the western banks of Lake Bratan in the Bedugul Highlands at a level of 1239m, is one of the most picturesque and most photographed temples in Bali. Ulun Danu is inside the caldera of the now extinct volcano Gunung Catur. Ulun Danu Beratan Temple mostly called as a Ulun Danu Temple but not to be confused with Ulun Danu Batur Temple, which is on the rim of the caldera at Batur Lake. Candi Kuning Market is the name of traditional fruit and vegetable market situated in the mountain area of Bedugul Bali. It is strategically located beside of the main road from Denpasar to Singaraja and many visited by tourists or local people who pass this market. The market sell variety of fruit such as durian on season, manggo, banana, salak (sanke fruit), papaya, green apple, avocado, strawberry, sweet corn, peanut, coffee powder, and many kind of herbs. For flower and plant they sell orchids, carrot, rose, orange and etc.